I’ve made no bones about what I think the Cleveland Browns should do with the No.1 overall pick in the upcoming NFL Draft. Despite the clamors for a quarterback or talk of trading out, I think the Browns should stay put and take Texas A&M defensive end Myles Garrett. It certainly sounds like he could be a game-changing talent for Cleveland, something the team can’t afford to pass up on. I say this almost completely convinced Garrett ends up on another team come draft day. It’s not something I’m excited about, especially considering the former Aggie has been labeled as one of the only can’t-miss prospects available. Based on the numerous scouting reports, the talent drop-off between Garrett and the players below him is significant. Why, then, do I think Cleveland will pass on what almost everyone sees as the best player in the draft? Well, I’ll give you three guesses, but you’ll only need one. Yes, it’s the Browns eternal hunt for a franchise quarterback. If anything is going to get in the way of them picking Garrett, it’s deciding to instead pick a rookie QB. And, if anyone is going to be the determining factor when it comes to selecting Garrett or a quarterback, it’s coach Hue Jackson. Cleveland’s coach said as much at this week’s NFL Combine, telling reporters he’s taken the lead on finding the team a franchise QB. Whether said player can be found with the first overall pick or in free agency will be up to him. The temptation will certainly be there to take one in the draft. At the moment, though, it’s difficult to predict whether or not Jackson will buckle to that pressure. When you break down the situation he’s in, you certainly don’t envy the choice he has to make. Though many think the Browns have to take a quarterback early, numerous rumors note Jackson might not be on board with such an idea. Many believe he would much rather have a veteran behind center this year, knowing he needs to start putting more wins on his record. Because of this, it certainly sounds like developing a rookie isn’t high on his list of priorities. You could argue the solution to this is to draft a quarterback who happens to be the most pro-ready prospect. Saying as much certainly wouldn’t be incorrect. There’s just one problem – none of the top three QBs are seen by anyone as a player who’ll be ready to start in Week 1. This isn’t to knock Mitch Trubisky, Deshaun Watson or DeShone Kizer. Each incoming rookie can easily be labeled as a first-round pick. That said, each come with some red flags. Whether it be lack of experience (Trubisky), concern about transitioning into a pro offense (Watson) or coming out of an inconsistent season (Kizer), neither of these quarterbacks can be considered a sure thing. Well that settles it, then, right? Jackson doesn’t have a pro-ready player to pick, so go Garrett and try to find a rookie QB later in the draft as a project. Throwing a wrench into this thought process is the fact Jackson – and everyone from the Browns for that matter – is getting hammered with questions about finding a quarterback. Cleveland’s need for a franchise QB is all he hears about. Of the numerous questions he or any other front office member have been asked since the season ended, you could safely say 90% revolve around finding a solution at quarterback. 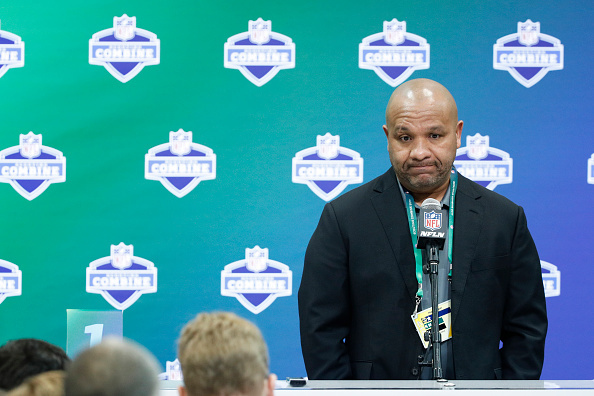 Nobody is sold on the current options available on the Browns’ roster, and there certainly don’t seem to be any legit game-changers available in free agency. When you have to hear about your team’s lack of a franchise quarterback as often as Jackson has, it makes this specific need tougher to ignore. The option of targeting other positions starts sounding less appealing, and it wouldn’t be surprising if he and the rest of the Browns front office started buying into the belief everyone has been falling back on for a long time now. The one fans are reminded of every season, as losses continue to pile up on a yearly basis. This team will never start progressing until it finds a franchise quarterback. Discredit this outside pressure all you want, but I have a tough time believing it won’t impact how Jackson approaches the draft. That said, will the urges to find a fix at QB convince Jackson to choose against drafting a can’t-miss prospect in Garrett? Or will he succumb and take someone like Trubisky or Watson first overall? We’ll find out soon. Like I said, knowing the weight of this decision, I don’t envy Jackson whatsoever.